Folkston, GA--Some trips are better than others. A few end up being disasters. This one was hard to beat, and some Fellow Travelers said it was the best paddling trip yet . Donald May, Joey Autrey, Carla Pollock, and Charlie Stines met in Moultrie to travel to Stephen Foster State Park to meet Art Shelfer, Eric Moye, and Roy Moye. Tim Eidson backed out. After loading the canoes onto the trailer and the gear into the Suburban Profane and trailer, the journey to Fargo began. Once at Stephen Foster, the gear and Roy's canoe were put onto the trailer. Art and Roy left their cars at Stephen Foster to make the final shuttle simpler. It looked like Okies fleeing the dust bowl, but nothing fell off on the long drive to Suwannee Canal near Folkston. Hamp and Haley Chauncey were awaiting the others, and the canoes were loaded for the three-day paddle. Everyone had a partner except Charlie, and he got to use his eBay Wenonah Prism solo. The trip down the Suwannee Canal is pretty, but it is more of the same. Carla was especially wary o f seeing alligators, but after the first few she decided they were really enjoyable creatures. The weather was perfect. The sky was blue, and there was no rain threat. The fall wildflowers were gorgeous. The canal has the typical blackwater which reflects like a mirror. The first stop was at Coffee Bay. 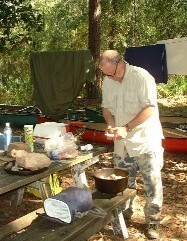 A group of men from Gainesville, Florida, had camped at the Suwannee Canal shelter and were at Coffee Bay. After exchanging pleasantries and determining it was the first time they had made a canoe trip, the group left the Travelers to eat snacks and taunt the resident one-eyed gator. The purple trail to Round Top turns right about three miles beyond Coffee Bay. It was much different than the 2001 trip on the same trail--mainly because the water level was sufficiently high to allow the canoes to actually be paddled rather than poled through the muck. The hooded pitcher plants were everywhere. Joey complained about having to work so hard paddling through water lilies. The crew reached Round Top shortly after three. Hamp wanted to try out the solo Prism, so he set forth on an adventure of his own. The rest just rested until supper time. Roy cooked a creole dish with rice, olives, sausage, shrimp, and vegetables. Greg Baker was not on the trip, so no one came down with indigestion. Art's suggestion that no one pitch tents until after supper was taken this time. Four tents plus Art's major award, the tent cot, gave everyone a place to sleep. Willard, the resident alligator, kept begging for goodies, but he was not appeased. Later, his friend also joined him. Just after everyone went to bed, there was an enormous splash. Everyone except Roy thought it was Willard splashing, but Roy got up to check out the noise. The real noise was Art. He had gone to relieve himself and stepped off the platform, taking a mud bath in the process. Charlie waited until daylight to make the coffee. It is not as noisy an event since the pump on the three-burner Coleman has been replaced with a CO2 cartridge major award. Once everyone was out of the sack, Hamp and Haley prepared a great breakfast of ham and eggs along with buns. Two sandhill cranes appeared during the morning hours. They had been heard on Saturday night but did not appear until morning. Once breakfast was finished, the canoes were reloaded and the trip toward Floyd's Island began. Art lost his famous hat somewhere at the platform. Charlie took the lead and was rewarded by two more sandhill cranes and an otter. There were also lots of ibises and egrets, and a lone hawk perched in a tree. Believe it or not, no one saw a single vulture the entire trip. It is a relatively short trip from Round Top to Floyd's Island, but the paddlers took a long break at the junction of the purple and blue trails. From there it was just a short distance to the man-made canopied trail to the island. Charlie as lead man had the task of clearing spider webs. There was enough water in the canal for the boats to float all the way, even though there were a few logs which had to be negotiated. The Fellow Travelers reached the east landing at Floyd's Island shortly after noon. 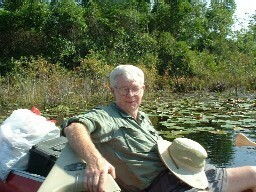 The canoe cart which Diane purchased at an L.L. Bean store was used with mixed results. Once the canoes and gear were at the old cabin, the tents were pitched, the chairs brought out, and most everyone sat around and told lies. A few did explore the island. Donald saw a deer, but there were no foxes, armadillos, or raccoons to be seen. Woodpeckers and owls disturbed the silence a bit, though. Art was Sunday night chef. He used the Dutch oven to prepare a roast with venison and beef, and named Elmo stew. Everyone said it was good, but some was left out overnight and went undisturbed by raccoons. Hamp built a nice fire, and the paper trash was burned. A few of the campers roasted marshmallows over the open fire. Once primed, the pump provided iron-sulfur water for baths. Only Art slept in the cabin, and he did that in his tent cot. The snoring was definitely second-class. No one could compete the quality and volume which W.H. can produce when he co mes along. Again, Charlie waited until daylight to make the coffee, then he prepared a breakfast of pancakes, syrup, and thick-sliced bacon. Once eaten, camp was broken and the canoes were carted and carried to the west landing. The first short stretch was extremely shallow and did require some hard pushing off the bottom, but then the canal was easy paddling. Charlie again went first, and as a result saw more wildlife. A group of at least a hundred egrets, ibises, and wood storks were in the grass just prior to reaching the spur route to the Big Water shelter, but they all flew away before a picture could be taken. The canal to the island joins with the red trail between Big Water and Minnie's Lake. It is not a long paddle to Minnie's Lake, but it is a scenic one through some prairie and through some beautiful hardwood forest. Minnie's Lake was at its best, and the gators were plentiful. The paddlers then took a break at the day use shelter at the south end of the lake. From there the trail goes through the Middle Fork Run of the Suwannee. This is one of the prettiest areas of the swamp. Huge cypresses grow in the water, and negotiating around them offers a challenge. Some canoeists claimed they made the entire run without hitting a tree. There were a few more alligators and birds on that stretch. The Middle Fork Run joins Billy's Lake, and from there on it is like paddling a wide river. Roy, Eric, Joey, and Carla opted to go to Billy's Island since it was new territory for Joey, Carla, and Eric. Carla saw three deer on the island. Art, Donald, Hamp, Haley, and Charlie paddle on past numerous alligators to the take-out at Stephen Foster so they could perfect the shuttle. Diane arrived to meet Charlie at the park, and arrived just before the first paddlers. Art loaded all of Hamp and Haley's gear into his car, and took them and Donald back to Suwannee Canal where Hamp and Haley could set out for Kingsland, Art could head for Tallahassee, and Donald could bring the Suburban Profane back to Stephen Foster. Roy and Eric were able to leave from Stephen Foster since they had risked riding the Suburban to Suwannee Canal on Saturday. Everyone except Charlie and Diane left. They had rented a cabin at the park and stayed until Wednesday morning. It rained most of the day Tuesday, so there was no more canoeing. Diane had driven the Toyota 4Runner over, so the trailer was left behind and towed home by the Toyota. It proved to be a capable trailer hauler. 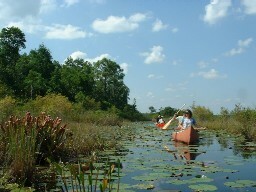 The Fellow Travelers will do another swamp trip next October. It will be difficult to have one as nice this one!